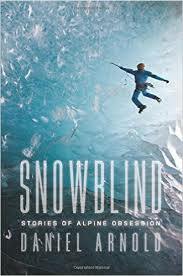 Snowblind by Daniel Arnold is a collection of fictional short stories highlighting extreme weather conditions and how they relate to the obsessions and excesses commonly found among mountain climbers. We learn that some men and women will risk anything, from disfigurement of severe frostbite, to the life of a fellow climber, if that’s what it takes to reach the summit’s top. Arnold takes us up the highest peaks in Asia, Europe and the United States. Some stories are spellbinding. If there is a fault in this action-packed book, it is when climbers’ behaviors become so extreme, it seems unbelievable. However, some of the dangers and risks portrayed in non-fiction, such as Krakauer’s Into Thin Air, are also difficult to believe, so in Snowblind, the line between fact and fiction is likely a fine one. I found the book highly informative. For instance, when climbers run out of daylight, they often tie onto the vertical side of the mountains and sleep standing up on a narrow ledge. Also, the cost of mounting an expedition can run up to $100,000 dollars or more. A trip with a dozen climbers might use 100 sherpas whose jobs are to carry food and equipment for the climbers and themselves. Also, most Sherpas are ordinary men looking to make a buck, not tough, fearless mountaineers like the legendary Nepalese guide, Tenzing Norgay. As food is consumed and equipment (for both climbers and Sherpas) is no longer needed, the Sherpas are then paid and sent back down the mountain. Unnecessary equipment is abandoned, thus leaving the mountainside looking like a garbage heap. Snowblind js awash with death defying deeds, but Arnold is also a master at describing variable weather conditions, characteristics of certain mountains or idiosyncrasies of those who climb them.